The Weathering Magazine issue 9 : KO and Wrecks coming soon! Coming very soon the next Weathering Magazine, issue 9 dedicated to Wrecks, Knockout vehicles, neglects cars and much more. Stay tune for more updates . 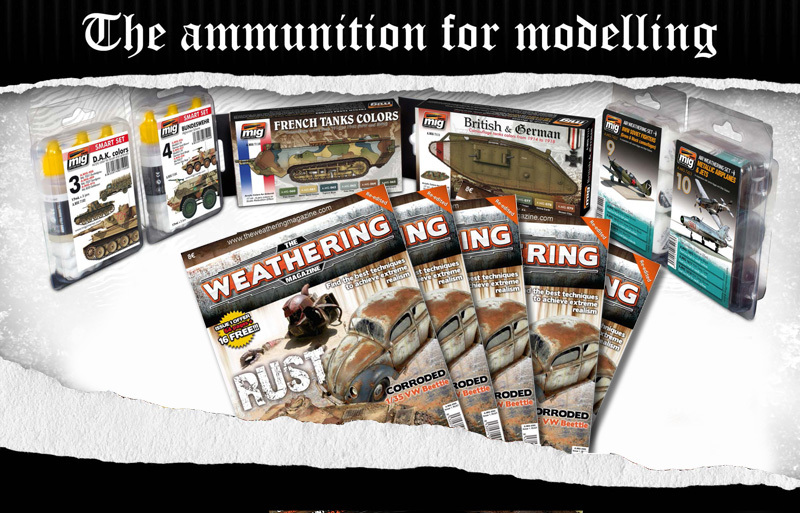 Ammo lastest report of new paints and the reprint of issue #1 of The weathering Magazine. Also available this month are exciting new sets for aircraft modelers including a set designed for bare metal and jet engines which is sure to be a huge hit with all modelers and another one for Soviet fighters during the WWII painted in green and black. The latest issue of The Weathering Magazine its here! The Weathering Magazine" arrives as a specialized publication designed for modelers of all skill levels and subjects. Each issue delivers to you, the most advanced weathering techniques and the related products used to achieve incredible results. Each issue will address in depth a specific topic to help us focus throughout the weathering process. In "The Weathering Magazine", talented modellers from around the world will demonstrate and teach us the best and most advanced techniques to achieve the most realistic look for our models. An original idea by Mig Jimenez. REVIEW REPOSTED FROM IPMSUSA.ORG (ALL RIGHTS BELONGS TO IPMSUSA). Model Art Modeling Magazine is a Japanese publication that is released monthly. The text is mainly in Japanese with some English subtitles throughout. The magazines’ striking feature is the high quality of the photographs showing the models used. This issue has two feature articles instead of just one, as normal. The first article covers the Pz.Kpfw. IV. They use models of an Ausf. 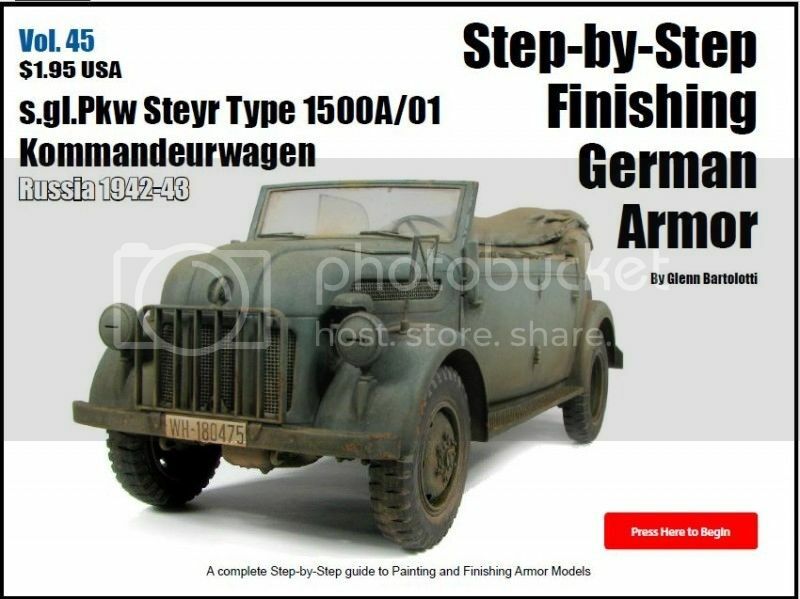 D by Tamiya, Ausf. F2(G) by Dragon, Ausf. H early by Tamiya, and an Ausf. J late production. These are all 1/35th scale. 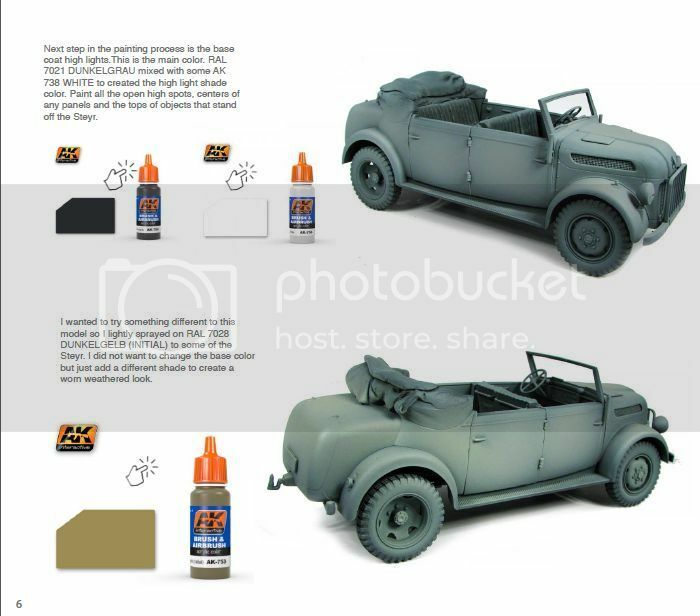 Within the article, they go over how to improve these models, along with a breakdown of German gray between three different paint manufacturers (Mr. Color, Tamiya enamels, and Vallejo). The last part of the article consists of photos of a Pz. IV Ausf. J. in a museum, along with line drawings of some of the differences between versions. The second feature article covers the Pz.Kpfw. VI, or better known as the Tige". As with the first article, they use several models. The models used are King Tiger by Academy, Tiger I early production by Cyber Hobby, Tiger I early production by Zveda, and a Porsche Tiger from the "Girls und Panzer" series. Again, these are all 1/35th scale. They go through tips on how to improve these models. 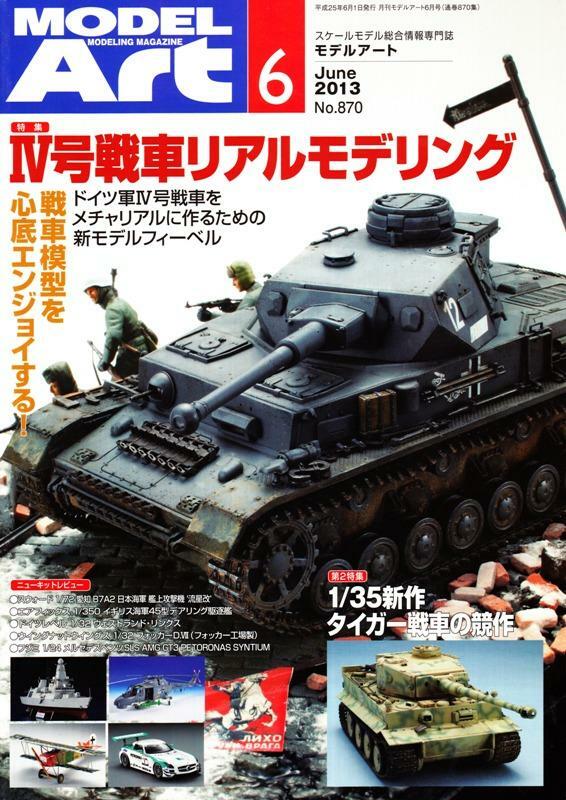 One note about the "Girls und Panzer" model – I know that it seems a little creepy, but it is huge in Japan where there are more female modelers than here in the States. It is just a way that they use to keep the interest in model building going from generation to generation. Next up is a continuing series in this magazine, Modeling JASDF. Last month, they finished building a T-28. This month they start covering the F-15D. They use several black and white photos and color photos of the actual aircraft along with a multi-sided color drawing. Next, they move into the new kit review. This month they review the Airfix 1/350th Type 45 Destroyer, Revell 1/32nd Westland Sea Lynx Mk.88A, Wingnut Wings 1/32nd Fokker D.VII (Fok), Fujimi 1/24th MB SLS AMG GT3 Petronas Syntium, and the Sword 1/72nd Aichi B7A2 Ryusei Kai (Grace). The last article is a reoccurring feature that is included in every issue, the Neo Historic Garage. This month's feature model is the Aoshima 1/24th Nissan Skyline GTS-t Type M HCR32 '89. The rest of the issue consists of new kit, accessories, and decal announcements. There are also many hobby shop ads, but they are all in Japan. Even though the majority of the print is in Japanese, I still find this magazine a wealth of modeling information due to the great photography. I would like to thank Model Art and IPMS/USA for the opportunity to review this product. 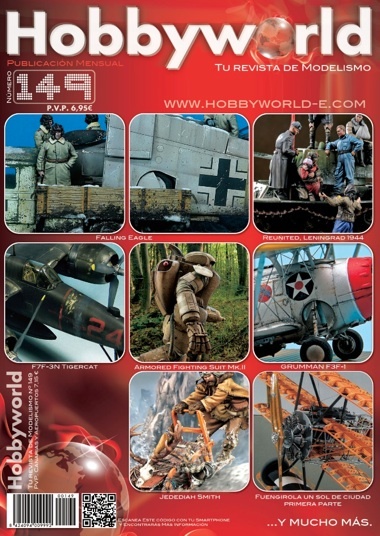 Hobbyworld Magazine december issue is here!